My family is my highest priority and I sometimes worry about how I’m doing raising my kids to become good adults. Am I raising them to be courageous? Kind? Respectful? Non-judgemental? Honest? Hardworking? I feel like in this world we are fighting an uphill battle to instill all the core values in our children that once were just standard behavior. Sadly, these values are not something we are constantly surrounded with at school, our peers, or basic network TV shows. I, by all means, have not been perfect in my parenting and my kids are not perfect. Recently, I have been in a couple situations with my 5 year-old and his peers and I left quite discouraged. I wasn’t impressed with the way I felt the kids were treating each other or the adults. When talking to the adults in charge, the tone in some of the kids voices was honestly appalling and then to tease and put each other down was being considered humurous. I have realized that I am going to have to put a much bigger effort in teaching my kids good morals and values, because sadly I feel like the expectations of kids these days is not what they should be. And they are not getting that “appropriate” behavior reinforced in their day to day lives like they used to. Don’t be afraid to try something new, even if you may fail. My husband, Scott, has grown up on dirt bikes his whole life. He has literally been counting down the days until our first born was old enough to get his own dirt bike. 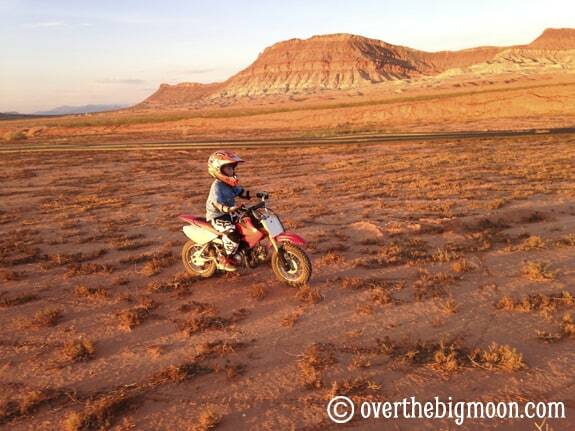 We decided to give Nathan his first dirt bike for his 5th birthday this last summer. Nathan is the type of child that is overly cautious. So, at first he was excited, but then he realized that he could fall and he was immediately nervous. So, we reminded him of how he was brave by trying it and even though he fell quite a few times, he got back on and kept with it. And, now he can ride without fear. Just like Dusty was afraid to fly high, above the clouds and storms, but with courage, practice and persistence – he overcame his fear. 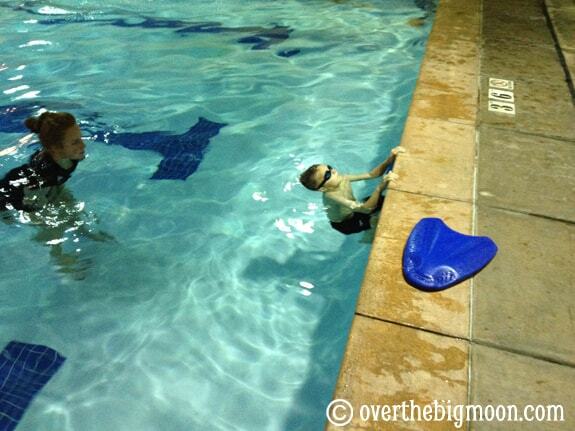 We also talked to Nathan about how far he’s come with his swimming. He loves the water, but when it came to learning to swim without floaties he had created this fear of the deep water. He could swim in shallow water, but in his head the second he went into deep water he was going to drown. We enrolled him in private swim lessons last month and in just a few short weeks of practice he has now decided he wants to work towards trying out for the beginning swim team next Fall. 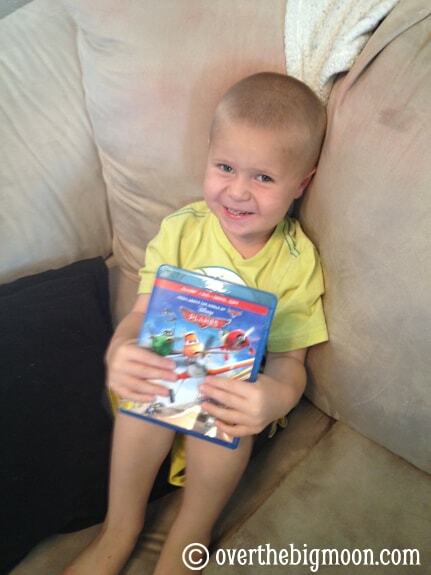 We’re so proud of how courageous he has been! If you make a mistake, admit it and learn from it. We all make mistakes. Our Jeffrey does not like to admit when he was wrong or does something naughty. Where he is only three, I haven’t been super diligent on trying to make sure he understands every little thing he does wrong. But, now that he is getting older, I have been taking the time to try to explain it to him. Especially if it has anything to do with how he treats a sibling or friend. Just like Ishani helped Ripslinger, so she could get a new fancy propeller she then realized that the price she had to pay was too high and she admits she was wrong and to make it right she gives Dusty the propeller when his was later damaged. When you make a mistake, admit it, learn from it and make right of the situation. Do the right thing, even if others are not. We are surrounded by 20+ cousins and when all the little boys get together it generally equals trouble! I had example after example to share with my boys just within the cousins (ie: getting into the baby powder at grandma’s, going in neighbors yards, throwing legos EVERYWHERE, etc). I made sure to point out that just because others were doing it, it didn’t make it right. If they find themselves in that situation that they should have courage to not follow suit. In the movie the majority of the planes were choosing to follow Ripslingers advice and sabotage Dusty to get him out of the race. We discussed with the boys that it took courage for the planes that eventually stood up to Ripslinger in behalf of Dusty. Do not give into negative peer pressure. 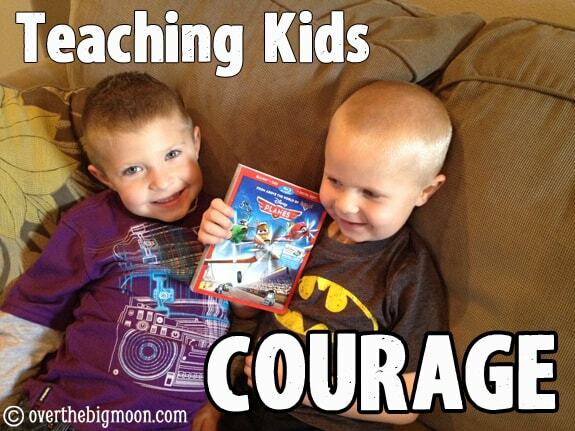 This is one of the areas that I hope I can truly teach my boys to have courage. We spent this last weekend at my best friend Kendra’s house. We were talking about some boys that her 6 year-old son plays with in the neighborhood. One of boys plays great with her son, until another neighbor boy comes around. Then, from peer pressure, he starts excluding her son and being mean to him. I used the situation to discuss peer pressure to my boys and asked Nathan if he ever has friends pressuring him to do things that he knows aren’t right. What would be the courageous thing to do in that situation? What would you say to them? 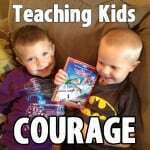 I especially want them to have courage to accept and include kids that may be a bit different from them. My Nathan has made great friends with a little boy, Kade, in his school class that uses a walker. Everyday when I drop off carpool he and his friend always call after Kade and run to catch up with him. It always makes my heart full, because I in no way told him to go be friends with this boy. In Kindergarten being accepted when you have physical challenges isn’t really as much of an issue. But, I have a nephew that has Cerebral Palsy and I have watched as kids ask him why he walks funny and not being able to keep up and being left out, etc has affected him. I hope that I can teach my boys to always make everyone feel included and wanted, even if they are a little different than they are. Dusty was different from all the other planes, because he was a crop duster. When he went to try out for the race – all the planes looked at him funny and told him he didn’t belong. I asked my boys how do they think that made Dusty feel? How do you think Kade or Ky (their cousin) would feel if people treated them like that, just because they’re different? Tell the truth, even if you know it’s going to result in negative consequences. Truth telling takes a lot of courage. My Nathan has always been very good at telling the truth. As he gets older, I’ve caught him a few lies, but it really is a rare thing. My Jeffrey on the other hand will not tell the truth if he knows it is going to get him put in time out. He will even blame a mess on Nathan, even if the entire time the mess was being made, Nathan was at school. So, we explained that YES, it takes A LOT of courage to admit you made a mistake or did something wrong, because there generally is a negative consequence. But, in the long run, his family, friends and teachers will all respect them more. In the movie Planes, Dusty finds out that Skipper only flew one mission, even though he had told him stories of many many missions. When Dusty finds out the truth it makes him feel betrayed. This was Skippers negative consequence – disappointing dusty and making Dusty feel betrayed. 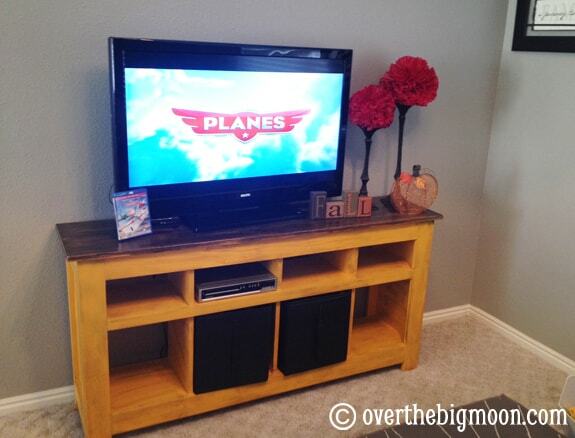 So, who is excited to get Disney Planes and sit down and talk about Courage with their own kids? You can Facebook or Twitter! Thanks so much Janet! So glad you guys were happy with it! Thanks for the opportunity, I had a great time and my boys loved it too! This was a good post. I only have a one year old but I think this is a cool way to help teach kids. I love how you broke it down. Did you talk about all of these points after the movie or did you stop it and talk about them during the movie? Just curious. I love little Jeff’s face in that last pic. You are an amazing mother. And you inspire me to do more. I talked about them after – but my boys are 3 and 5. If they were much younger I would possibly think about talking about them during the movie. So, the scenes were more fresh on their mind. And, thanks for the kind compliment! You are too nice and such an amazing mother yourself Anner! Liam and Massimo are so lucky to have you!